If you or your loved one was in an aircraft accident, obtain experienced legal help. This is a highly complicated area of the law hinging on technical details and expert analysis. At Friedman, Rodman & Frank, P.A., we have access to industry-leading experts invaluable in helping us determine the cause of the accident, even when liability is initially unclear. Our firm's Miami plane crash lawyers have more than 100 years of combined experience handling highly complex personal injury claims. Yet, we know that every case is unique. That is why our law firm works with aviation experts to identify potential liability factors such as pilot fatigue, defective equipment or poor maintenance. We are committed to holding all at-fault parties accountable so you can recover the full extent of damages you are entitled to receive. 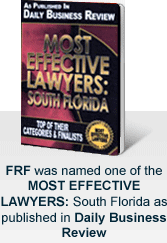 Contact our Miami aircraft accident lawyers today to schedule a free initial consultation. Commercial airplanes are generally insured by large insurance companies with extensive resources. Their top priority is to mitigate their exposure to liability. When the stakes are high, entrust our law firm to help secure your rights. We have an extensive background going up against large insurance companies with a pool of resources. If our investigative efforts uncover that more than one party was at fault, we will pursue maximum compensation from the liable parties. For example, if the pilot was operating the plane with maintenance errors, while under the influence of drugs or alcohol, we would seek damages against the pilot and the maintenance company. Our top priority is to help you obtain maximum compensation for past and long-term damages you have sustained. We can also work with psychologists to understand the extent of your emotional scars. If you are unable to work, we can consult a vocational expert or economist to help us understand the amount of compensation you are entitled to receive. We will explore every avenue to help you obtain maximum compensation for past and long-term medical needs, lost wages, and pain and suffering. Our firm's personal injury attorneys pursue a full financial recovery for families with wrongful death claims. No amount of compensation can fill the void from the loss of a loved one, but we want families to focus on the future without worrying about covering the expenses associated with a fatal accident. We are committed to helping clients with wrongful death claims obtain compensation for any funeral expenses, lost wages, medical expenses related to the accident, past and future pain and suffering, loss of companionship, and loss of support. Our door is always open for aircraft accident victims. To discuss your options with an experienced attorney, contact our personal injury firm online or call 305-448-8585 or toll free at 877-448-8585. We are available 24 hours a day, seven days a week. All consultations are free and confidential.